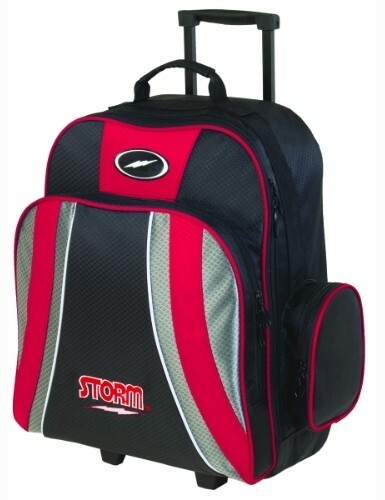 The Storm Rascal 1 Ball Roller is a great bag for rolling a bowling ball, accessories and a pair of shoes! The bag is very easy to open with large oval bolt zippers and reinforced stitching. Your bowling ball will be protected with a foam base. I wanted to replace my bowling bag because it was very hard to handle. It turned over easily when rolling and was just not convenient to use. The Storm Rascal bag is everything I was hoping for. It is very sturdy and rolls easily. It stands up on its own and holds everything nicely. Great bag choice. The handle seems weak and doesn't stay up when maneuvering the bag. Bought this for my mother, she loves it. Grandson loves the ball roller! A Christmas gift for him! Grandson wanted the Bowling Bag roller so was a great idea for him for Christmas. Sent us a photo and the bag is great! Nice looking bsg, great price and timely shipping. Very satisfied. Sturdy. Lots of room. Nice looking. Really like this bag, rolls great,easy to handle & has lot of room for everything I need! To and from bowling, carry it in trunk of car doesn't roll around. Handle is non locking, so at times if want to push the carrier the handle slides down, so then I pick the bag and turn it around. If I was aware of the non locking feature I probably would've got another bag. What does the bag weigh? Hi Bill. Yes, the handle will lock into place. It will have 3" wheels. Due to the time it takes to produce the Storm Rascal 1 Ball Roller Black/Red ball it will ship in immediately. We cannot ship this ball outside the United States.